Several years ago, I interviewed a senior Tibetan Lama on ‘The Karma of Tibet’. I was then putting down on paper some historical reflections on what happened to the Tibetan Nation. I consulted a Lama in Dharamsala. He spoke good English and was then the Director of the Library. Was there a defection on the Roof of the World? Yesterday, the same Lama was in the news for completely different reasons. Incidentally, for the first time since a long time, the Chinese media uses the term ‘clique’ to speak about the Dalai Lama’s Administration. It confirms the general hardening towards the Dalai Lama. China has discreetly started appealing to the Tibetan Diaspora to join again the ‘motherland’. The move was decided during Central United Front Work Conference held in Beijing from May 18 to 20. …During his intervention at the Conference, Xi Jinping spoke of strengthening of the unity of ‘three types of people’. Who are these 3 types? Xi named them: overseas students, media representatives, and non-public economy representatives. The website affirms that there are about 170,000 Tibetans living abroad in 33 different countries. The Communist tabloid commented: “Move indicates futureless end of the Dalai Lama group”. Cui Baohua, a member of the Standing Committee of the Sichuan provincial committee of the Communist Party of China, went to meet the Rinpoche, who is supposed to have told the cadre: “Now I am a 'real' Chinese citizen. And all I want to do is to fulfill my duty as a Chinese citizen." Amchok Rinpoche was a well-known figure in Dharamsala, having occupied, amongst others the seat of Director of the Library of Tibetan Works and Archives. Is it a purely propaganda exercise from Beijing or was Amchok Rinpoche (who has already re-baptized ‘Anqu’ in pinyin) genuinely keen to return to his native land and work from there? It is difficult to say, but it is sure that the new policy of the United Front Work Department is to tell Tibetans ‘let bygones, be bygones’ and score important propaganda points against Dharamsala. At the same time, Beijing is extremely nervous about Lukam Jam Atsock’s candidature to the post of Tibetan Prime Minister (Sykiong): Lukam Jar advocates Rangzen, an Independent Tibet. It is far from the mild ‘Middle Path’ sponsored by the Dalai Lama (and not even accepted by Beijing). Will more ‘defection’ happen? It is too early to say. But the presence of a senior Lama from India in the restive Ngawa Prefecture could ultimately turn to be a problem for Beijing. Who can change China's Karma? Only the furure will tell us. To come back to Amchok Rinpoche, several years ago, during the course of a research, I questioned many Tibetans on how they viewed the working of this famous Karma and its place in their nation’s history. In my Karma of Tibet (free download). I wrote: “We specifically interviewed a scholarly Tibetan Lama on this question of Karma. Hereafter he is referred as ‘the Lama’; he made some thought-provoking remarks, though several others interviewees answered on similar lines. If one looks at history through Tibetan (or Buddhist) eyes, especially the relations between India, China and Tibet, one not only deals with historical events, but with movements of forces and currents (or sometimes undercurrents) which have a much deeper significance but which are ignored by serious 'historians'. For Tibetans, history is an iceberg and we are aware only of the most superficial results of certain world movements which we name ‘historical events’. Having an overview of the Himalayan peaks ignoring the depth of the valleys and height of the mountain ranges, would be similar. Whenever we questioned Tibetans about their history, they said: “Our Karma had to be exhausted”. For the Lama (Amchok), the recent history of Tibet was a wave that nothing could stop. The question we raised was, where does this ‘bad’ Karma come from? Is it selective? When has it been accumulated? Did it take years or decades before ‘ripening’? It is true that in the old Tibetan society, at least at the beginning of this century, Tibetans enjoyed life. The aristocracy, in particular had a life of pleasure, a life of ‘silk brocade and picnic’. It is enough to read the books of European explorers of the first half of the twentieth century until the invasion of Tibet, to understand that the Old Tibet was a harmonious and protected world living timelessly. There were certainly a lot of social differences in the life conditions of the aristocracy (lay and monastic) and people working for them, but everyone seemed to be happy, everyone had enough to eat, life was peaceful and somehow harmonious, in spite of the hardship of daily life. It is perhaps this image of peace and harmony, which gave birth to the perception of the mythical Land of Snows which caught the imagination of the West. This incredible harmony was not restricted to the different strata of people, but there was also a harmony with nature and even with the gods. Tibet was Shangri-La, the paradise on earth, and the fact that it was closed to the outside word helped to contribute to the mystique of the land. The Lama told us: “We did not think before and then it struck and we thought: ‘Maybe it is not for us, maybe it is only for someone else in the world, it cannot be for the Tibetans’. We kept on neglecting our duties”. It took only a few months for the Tibetans to understand that “it was for them”. The Lama further explained that for the Tibetans, this continued negligence in their life provoked an accumulation of ‘bad or negative Karma’, which had grown stronger and larger. What was just a seed in the 1930’s and 1940’s, kept on growing over the years, and one day of 1950, the harvest was ready. Soon after the 1950 earthquake, the Tibetans understood that it was no more a warning. As if confirming the forthcoming dark days, all sorts of ominous celestial glows and lights were spotted everywhere in Tibet. On the political scene, Tibet had no friends left. The British had left India and were only remotely interested in what was happening on the Roof of the World: after all, they no longer common borders with Tibet. Their successor, the Government of India was in two minds; some of the more visionary leaders, like Sardar Patel understood the strategic importance of Tibet for the security of India, but he would soon pass away while Nehru was already dreaming of his nebulous brotherhood with China. Moreover, the Tibetans had foolishly refused to immediately ratify the Simla Convention after the British left India, thereby upsetting the Indian government and losing their only possible ally. For the Lama, it was clear that the Thirteenth Dalai Lama had foreseen the forthcoming events. He had understood that the fruits of ‘negative karma’ were ripening and his Testament was a last attempt to warn his people about what the future held for them. He knew that it was probably too late, but, for him even this warning was part of the game. He believed that perhaps his Testament could give a future direction to his people. He based his predictions not only on his inner vision, but also on hard facts; he was a great mystic, but very much down-to-earth too. He had met many people from Mongolia, Russia, England and China and was fully informed of the world situation; he was aware that the world was changing and could foresee the kind of whirl it would soon be plunged into. There was certainly an acceleration in world evolution and revolutions were erupting everywhere. He sensed that Tibet’s negative karma was becoming too strong: the boil had to burst soon. Hence, he decided that he had no other alternative but to give a warning to his people, especially the Government officials before leaving his body. The Lama continued: “When the Karma becomes very strong, when it is ready to burst, at that time it is not very easy to change the consequences. In the 30’s already everything seemed already arranged, the ‘black karma’ was confirmed. It was as though we had a confirmed ticket and we were on the train, it is not easy to stop a train”. Some questions remain. Could the consequences have been changed, if the Tibetan officials had taken the warnings seriously and had acted upon them? Or was it already too late to stop the train? Could the black wave have been stopped? To further complicate the karmic question: a particular chain of consequences does not depend only on one group of persons or factors (in this case the actions of the Tibetan people), but on hundreds of forces. In this specific case, the neighbours of Tibet whose past and future have always been linked with Tibet, also had their role to play in the ‘karmic’ game. The Lama said that the Thirteenth Dalai Lama consciously decided to leave his body and come back as a young boy who would eventually be able to dissolve all the bad effects and wash out the negative consequences of the past actions of the Tibetan nation. The Lama went one step further when said that it might even be possible that the Dalai Lama made some calculations, “if he had to live till the end of the 50’s, when the negative effects would be at their full strength, then he would be too old to do anything meaningful [for Tibet] and the next 15 or 20 years would be wasted during the childhood and adolescence of his successor”. It was most probably preferable for him to leave his material sheath in the early 30’s and to come again soon, to be able to lead his people towards a new freedom as a young man. Many Tibetans believe that such was the motivation of the Thirteenth Dalai Lama and as a great yogi, he implemented the decision to leave and return in order to serve his people to the best of his capacity. It may appear surreal to look so at history but we should not forget that it is from this angle alone that the Tibetan people look at the world and its history. There is nothing to prove that the western version of history is superior to the eastern one. History itself has demonstrated that most of ‘modern’ theories have been wrong at least in their practical applications. To give an example, how have Nepal and Bhutan or the Fiji Islands become independent nations while Tibet, a much older nation, is still today in slavery? In supposing that the above reading of the Tibetan history is correct, it would suggest that the young Fourteenth Dalai Lama’s mission was to ‘wash’ away the past bad karma of his countrymen. In some way, he did when he opened up the knowledge of his nation and spread its Dharma the world over. Is it not ironical that the leader of a nation which in the past refused even to open letters from ‘foreigners’ is today hopping from one continent to another and has become one of the most respected figures amongst those ‘yellow-eyed foreigners’? His mission began early. At the age of 15, he became the Head of a state in crisis and immediately began his political activities, dutifully serving his country and his people. He did not have much time to enjoy teen-age years, but he knew that it was part of his destiny. The next question which comes to mind is whether what has happened to Tibet is not disproportionate, compared to the presumed negative actions committed by others? The Tibetans have certainly committed many wrong actions, but elsewhere in the world the French, the British, the Americans or the Chinese have also committed (and are committing everyday) worst actions. Was not Hiroshima or Nagasaki a bad karmic action for the Americans who still presume to be the conscience keepers of the world? Why then have the consequences been so dramatic in the case of Tibet? Even if one admits that there were many unresolved problems and wrong doings in old Tibet, why has the Land of Snows had to pay such a high price? Tibetan (and Indian) Buddhists could argue that the karma of the British is also very heavy; their colonies have suffered their own share from the imperialist policies of the Crown. The Partition of India by Lord Mountbatten with the consent of the Congress leaders is one of the worst ‘unpunished’ crimes against humanity. How many millions of people in the subcontinent are still suffering because of this action? In this case, as in many others, why does one see the ripening of the negative karma? Even for learned lamas, it is not easy to find an answer to this question. It is true that the supposed wrong actions of Tibet seem mild compared to many other nations; Tibet never had imperialist tendencies, during the last millennium. It never attacked its neighbours; Tibet had its own internal conflicts and disunity (especially in the first decades of the Twentieth Century) but was this so serious as to be the root of so much suffering and pain? Was it because the Tibetans were spiritually more advanced that they could ‘take on’ more on their shoulders? It is not for us to answer this question here. However, from a spiritual point of view, it is oft repeated that difficulties are always in proportions to the capacity of the disciple. If the history of modern Tibet is seen from a spiritual point of view, it is obvious that Tibet was able to bear more of a burden than many other nations. The Lama made another interesting point. Tibet has had long, sometimes difficult, sometimes smoother relations with India and China. Due to these old connections, the karma of Tibet ripened at a time when important developments occurred in these nations. In the Indian tradition, there are innumerable stories of gurus taking the consequent sins of their disciples on their own bodies. There is a marvelous story of Sri Ramakrishna, the great Bengali saint who at the end of the nineteenth century took on himself the sins of a prostitute that he met in a street. He immediately fell very sick and died soon after of cancer. The Lama said that during the Chinese occupation in Tibet, many great lamas, some very revered yogis, passed away in prison after serving a jail sentence for 10 or 20 years. While in prison they continuously prayed to lighten the karmic consequences for all human beings including the Chinese. According to the Tibetans, the Thirteenth Dalai Lama knew what was going to happen to Tibet; many other great lamas also knew but were aware that they could not stop the black wave. They had no alternative but to fully accept it and ‘deal’ with it. Consciously, they walked through the ‘long and dark night’. At the scale of a nation, the past fifty years of the Tibetan nation seem to be like this Great Passage; and because some lamas were conscious from the start that death and devastation were approaching for Tibet, they accepted the ordeal and kept their eyes open during the process. Their concentration and awareness helped all the other beings to go through so the nation could slowly be reborn. The process is not yet finished but the end of the tunnel is no longer far away and the sufferings of the people have tremendously decreased. The end will be come only after the rebirth (or independence) of the nation is obtained. Tashkent: who benefited the 'crime'? In a recent interview to a news channel, Anil Shastri, Congress leader and son of former Prime Minister Lal Bahadur Shastri, stated that his father's death did not look natural. He affirmed: “When my father's body came to the Delhi airport, the Palam airport as it was called then, and when it was taken out of the aircraft, that came as a shock because his body had turned blue. His face had turned blue and there were white spots on the temple." Anil Shastri asked Prime Minister Narendra Modi to declassify documents related to Lal Bahadur Shastri's in Tashkent. Anil Shastri explained that he finds ‘unbelievable’ that the Prime Minister's room, in the capital of then Soviet Uzbekistan had "no call bell, no telephone, no caretaker in his room and no first aid. He had to walk up to the door himself. …His death was badly handled by the Indian government. …Post-mortem could have been done in Tashkent if there was a request from the Indian government or a request from the Indian doctors." Interestingly, Anil Shastri asserted: "some close associates feel that suspicion revolves around an Indian hand or a foreign power." I am not Inspecteur Jacques Clouzeau, but simply looking at the 'foreign powers' which benefited the ‘crime’ (or simply Shastri's death), one of them is clearly China. After the 1962 war, Jawaharlal Nehru was physically and psychologically a broken man; he had realized that he had been taken for a ride by Mao - the strategist Chairman of the People’s Republic of China and Zhou, his Machiavellian Premier. He soon had a stroke and passed away in May 1964. The Government of India’s policy towards China (and Tibet) immediately changed after Lal Bahadur Shastri became the new Prime Minister. Shastri decided to take a tougher stand on Tibet and his government voted in favour of the Resolution for Self-determination of Tibet in the UN in 1965. The naked truth - which all of us must face - is that the Chinese Government is determined to obliterate the Tibetan people, but surely no people can remain for long suppressed. I have faith in the world community. I believe it will be able to help restore the Tibetans all the freedom which we have enshrined, with such dedication, in the Universal Declaration of Human Rights. It is for these reasons that we support, fully and wholeheartedly, the cause of the people of Tibet. Our hearts go out to them in their miserable plight and the terrible suppression that they are suffering at the hands of the Government of the People's Republic of China. My delegation will, therefore, vote in favour of the draft resolution. China was obviously not amused. 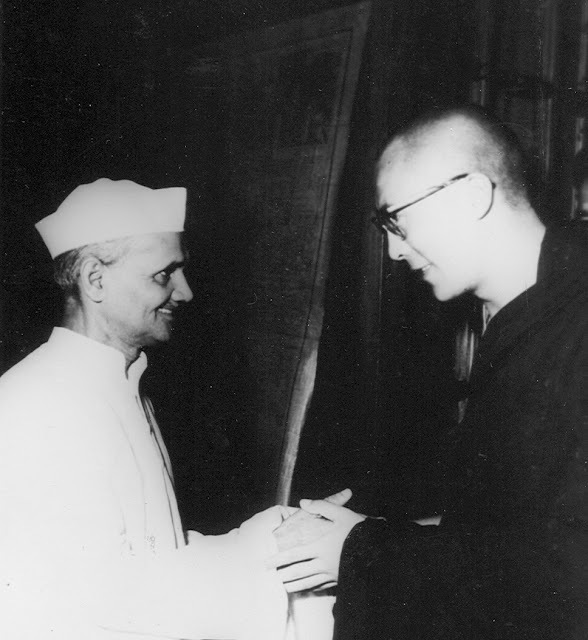 One day in September 1965, Tsipon Shakabpa, the then the Tibetan Representative in Delhi came down to South India to meet the Dalai Lama (during the 1965 Indo-Pakistani war, the Dalai Lama had been sent by the Government of India to South India ‘to avoid the shelling’, told us one day the Tibetan Leader). Shakabpa was very excited; he had just had a meeting with Prime Minister Shastri who told him that India had decided to recognize the Tibetan Government-in-exile after his return from Tashkent. Unfortunately for the Tibetans (and for India too), Shastri never returned from Tashkent. Indira Gandhi, who was subsequently elected Prime Minister, continued her father's Tibet policy. If Shastri had come back from Tashkent, many things would have been a different (for the Tibetans at least). I wish the Government of India would also declassify the minutes of the meeting between Lal Bahadur Shastri and Shakabpa. These Appendixes deal with the Chinese 'intervention' in the conflict. 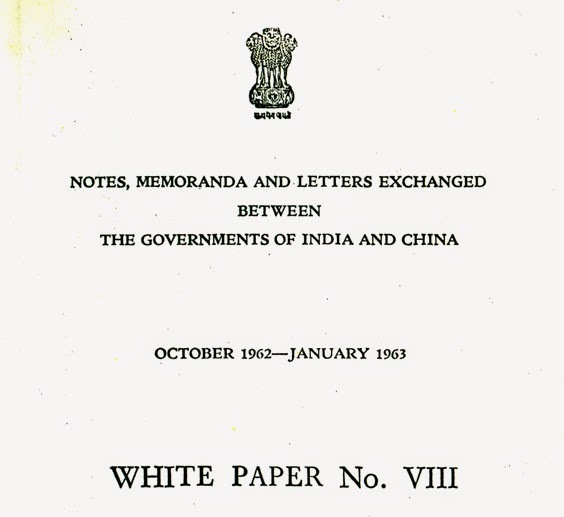 The correspondence between Delhi and Beijing is available in the White Paper XII, which can be downloaded from my website. The Chinese have intruded into Indian territory in Ladakh, in the middle sector and in Sikkim. The intrusion varies from two to three miles in the middle sector to a few hundred yards in Ladakh and in Sikkim. In the Dongchu La in Sikkim, the Chinese have intruded 800 yards into Indian territory. There was no exchange of fire between Indian and Chinese forces to-day [September 22], according to an official spokesman. The spokesman said he could not say what the Chinese would do at the expiry of the extended time limit at 9-30 to-night [September 22]. The Chinese posture was provocative. They were still on the border and at some points across the border in Indian territory. He could not say whether the Chinese would see good sense or do something more than what they had done already. The spokesman said that he had no confirmation of the New China News Agency report that Chinese forces had withdrawn from four points in the Sikkim and other sectors. According to reports received by the Defence Ministry, in the Sikkim sector, the Chinese continue to build up their positions and strength right up to the border. Statement of the Government of the People's Republic of China, 7, September, 1965. On September 6, 1965, India suddenly launched an armed attack on Pakistan. Indian troops have crossed the International Boundary between India and Pakistan and are pushing towards Lahore, the Capital of West Pakistan. The Indian radio has announced general mobilization. Thus the Indian Government has enlarged the local conflict between India and Pakistan in Kashmir into a general conflict between the two countries. In the face of the massive armed attack by India, the President of Pakistan has called on the entire people of the country to rise in resistance against the enemy and appealed for sympathy and support from all peace-loving peoples of the world. The Indian Government's armed attack on Pakistan is an act of naked aggression. It not only is a crude violation of all principles guiding international relations but also constitutes a grave threat to peace in this part of Asia. The Chinese Government sternly condemns India for its criminal aggression, expresses firm support for Pakistan in its just struggle aggression and solemnly warns the Indian Government that it must bear responsibility for all the consequences of its criminal and extended aggression. The Indian Government has always been perfidious on the Kashmir question. It once pledged solemnly with Pakistan to grant the Kashmiri people the right of self-determination. But far from honouring its pledge it has brazenly declared that Kashmir is an integral part of India and subjected the Kashmiri people to brutal national oppression. Where there is oppression, there will be resistance. It is entirely proper that the people in the Indian occupied area of Kashmir should rise up in resistance. In order to cover up its sanguinary suppression of the Kashmiri people, the Indian Government openly breached the cease-fire line in the disputed territory of Kashmir to intrude into the area under the control of Pakistan and carried out military provocations and armed occupation. This, of course, could not but arouse Pakistan to counter attack in self-defence. All this was in the nature of a local conflict in the disputed territory of Kashmir between India and Pakistan. India already committed aggression on the Kashmir issue. Now it has openly launched a massive armed attack on Pakistan. This is a still more serious act of aggression. The United Nations has always had an ill-fame on the Kashmir question. It solemnly pledged to guarantee national self-determination for Kashmir. However, 18 years have passed during which the United Nations watched on without lifting a finger while India acted lawlessly in Kashmir. The United Nations did not breathe a single word when India violated the cease-fire line. But as soon as Pakistan fought back in self-defence, the United Nations came out to mediate. This is by no means the end of the story. It is unconceivable that the United Nations, which has been unfair for 18 years, should suddenly become fair. The so-called mediation by the United Nations is based on a report of the Secretary General. The report itself is unfair. How can a fair conclusion be drawn from an unfair premise? On the Kashmir question, the United Nations has once again proved a tool of U.S. imperialism and its partners in their attempt to control the whole world. This will be further proved true during the current extended aggression against Pakistan by India. India's armed aggression against Pakistan is another exposure of the chauvinist and expansionist features of its ruling circles. The Indian Government glibly says that it pursues a policy of so-called peaceful co-existence. But actually it has never ceased for a single day its activities of bullying and encroaching upon its neighbours wherever possible. Almost every neighbour of India has known this from its own experience. The Indian ruling circles are the greatest hypocrites in contemporary international life. The Chinese people have had a deep experience of this. Although the Indian ruling circles did not gain anything from their massive armed attack on China in October, 1962, they have never stopped making intrusions and provocations along the Sino-Indian border. India is still entrenched on Chinese territory on the Sino-Sikkim border and has not withdrawn. It is constantly probing furtively and making intrusions and harassment against Chinese territory in the Western sector of the Sino-Indian border. Indian violations of Chinese territory are far from coming to an end. The Chinese Government has served repeated warnings, and it is now closely following the development of India's acts of aggression and strengthening its defences and heightening its alertness along its border. The Indian Government probably believes that since it has the backing of the U.S. imperialists and the modern revisionists it can bully its neighbours, defy public opinion and do whatever it likes. This will not do. Aggression is aggression. India's aggression against any one of its neighbours concerns all of its neighbours. Since the Indian Government has taken the first step in committing aggression against Pakistan, it cannot evade responsibility for the chain of consequences arising therefrom. The Chinese Government is deeply convinced that, with the sympathy and support of the peace-loving countries and peoples of Asia and the whole world, the hundred million people of Pakistan will rise as one-man to save their country and finally drive back the Indian aggressors. I want to inform the House that this morning we received a communication from the Chinese Government demanding that within three days we should dismantle our defence installations which they allege are located on their Side of the border in Tibet across the Sikkim border. I might for the benefit of the House, read out the relevant portions of the communication, although I would be placing the communication and our reply on the Table of the House. "In its notes the Indian Government continues to resort to its usual subterfuges in an attempt to deny the intruding activities of Indian troops along the Sino-Indian boundary and the China-Sikkim boundary. This attempt cannot possibly succeed. Since ceasefire and troop withdrawal were effected along the Sino-Indian border by China on her own initiative in 1962, Indian troops have never stopped their provocations, and there have been more than 300 intrusions into China either by ground or by air. The Chinese Government has repeatedly lodged protests with the Indian Government and served warnings to it, and has successively notified some friendly countries. The facts are there, and they cannot be denied by the Indian Government by mere quibbling. Moreover, the Chinese Government has four times proposed (the latest occasion in June 1965) Sino­ Indian Joint Investigation into India's illegal construction of military works for aggression on the Chinese side of the China-Sikkim boundary, but has each time been refused by the Indian Government. Now the Indian Government pretentiously says that the matter can be settled if only an independent and neutral observer should go to the border to see for himself. It further shamelessly asserts that Indian troops have never crossed the Sikkim-China boundary which has been formally delimited, and that India has not built any military works either on the Chinese side of the border or on the border itself. This is a barefaced lie. How can it hope to deceive anyone? We are sending a reply to all these points and as I said I shall place the reply on the table of the House. I will read out the relevant portions of our reply. "Ever since the Sino-Indian border problem was raised by the Chinese Government, the Government of India had made strenuous attempts to settle the question peacefully and with honour. Even after the unprovoked Chinese attack across the border in October­ November, 1962, the Government of India consistently followed the policy of seeking a peaceful settlement honourable to both the parties concerned. As has been pointed out in various notes to the Chinese Government in the past, the Government of India has given strict instructions to its armed forces and personnel not to cross the international boundary in the Eastern and the Middle Sectors and the so-called 'line of actual control' in the Western Sector. The Government of India are satisfied after careful and detailed investigations, that Indian personnel as well as aircraft have fully carried out their instructions and have not transgressed the international boundary and the 'line of actual control' in the Western Sector at any time at any place. The Government of India are, therefore, absolutely convinced that the allegations contained in the Chinese note under reply are completely groundless. The Government of India are constrained to reject these allegations and to reassert emphatically that they do not accept the claims to vast areas of Indian territory in the Western, Middle and Eastern Sectors of the border put forward in the Chinese note under reply. As regards China's stand on Kashmir and on the present unfortunate conflict between India and Pakistan, it is nothing but interference on the part of China calculated to prolong and to enlarge the conflict." The background of the matter is that in September 1962 some defence structures were constructed on the Sikkim side of the Sino­ Indian frontier. These structures have not been in occupation since the cessation of hostilities in November, 1962. Since the Chinese Government alleged that some of these structures were on their side of the border, India had in its note of September 12, 1965 gone to the extent of suggesting that an independent Observer be allowed to go this border to see for himself the actual state of affairs. The Chinese Government has not, unfortunately, accepted this reasonable proposal and has reiterated its proposal for joint inspection. In our reply which is being sent today, we are informing the Chinese Government that their contention is entirely incorrect. Nevertheless, as an earnest of our desire to give no ground to the Chinese for making this a pretext for aggressive action, we are informing them that we have no objection to a joint inspection of those points of the Sikkim-Tibet border where Indian personnel are alleged to have set up military structures in Tibetan territory. The Government of India on their part are prepared to arrange such an inspection as early as possible, at an appropriate official level, on a mutually convenient date. We have sent a reply to the Chinese note accordingly and hope that Chinese Government would agree to action being taken as proposed. Copies of the Chinese note and of our reply have been placed on the table of the House. I know the House would feel concerned about the intentions of the Chinese Government. We do hope that China would not take advantage of the present situation and attack India. The House may rest assured that we are fully vigilant and that if we are attacked, we shall fight for our freedom with grim determination. The might of China will not deter us from defending our territorial integrity. I shall keep the House informed of further developments. I place on the Table of the House the text of a further note which was handed over to our Charge d'Affaires in Peking yesterday. The House will recall that we had taken an attitude calculated to maintain peace when replying to the last note which we had received from the Chinese Government. It is clear from the kind of response which China has sent that what China is looking for is not a redress of grievances, real or imaginary, but some excuse to start its aggressive activities again, this time acting in collusion with its ally, Pakistan. The extension of the time-limit for the ultimatum was, in our view, no more than a device to gain time to watch what comes out of the discussions in the Security Council. The allegations which China has been making in the series of notes that it has been sending to us, are such that they would hardly justify any civilised Government in having recourse to force, even if the allegations were true. If there are any structures on Chinese territory in areas where the border is delimited and not in dispute even according to the Chinese, surely, there is nothing to prevent the Chinese Government from having them removed, instead of suggesting to us that we should have them removed, which would only be possible by our men going into their territory. Similarly, no one can imagine that any Government would threaten another on the ground that their cattle have been lifted or on the ground that out of the thousands of Tibetans who have sought asylum in this country two or four are being detained here against their wishes. To justify its aggressive attitude, China is pretending to be a guardian of Asian countries who, according to China, are being bullied by India. The basic objective of China, therefore, is to claim for itself a position of dominance in Asia which no self­ respecting nation in Asia is prepared to recognise. Large or small, strong or weak, every country in Asia has the fullest right to preserve its independence and sovereignty on terms of equality. The dominance of the Chinese cannot be accepted by any of them. We reject China's claim to tell us anything about what we should or should not do about Kashmir which is an integral part of India. Our offer of resolving the differences over these minor matters by peaceful means is still open. However, China's aggressive intentions are clear from the fact that even while they have in their note extended the time-limit by 72 hours, in actual fact they have started firing at our border posts both in Sikkim and in Ladakh. If, China persists in aggression, we shall defend ourselves by all means at our disposal. A formal reply to the Chinese note will be sent later today. May I say a word that we have just now received the full text of the resolution passed in the Security Council? Naturally, it deserves our very careful consideration, and I might be making a statement on that tomorrow in the House. I place on the table of the House a copy of the Security Council resolution, dated the 20th September, 1965, relating to the current conflict between India and Pakistan-a conflict which commenced on the 5th August, 1965, when Pakistan launched a massive attack on India by sending thousands of armed infiltrators across the cease­ fire line in our State of Jammu and Kashmir. As the Hon'ble Members would see, the Security Council had demanded that both Governments should order a cease-fire effective from 12-30 p.m. Indian Standard Time today, the 22nd September, 1965. On the question of cease-fire, the views of the Government of India were stated in detail and without any ambiguity in my letters of September 14 and 15, 1965, addressed to the Secretary­ General. As stated in these letters, the Government of India had clearly accepted that they would order a cease-fire without any preconditions on being informed that Pakistan had agreed to do the same. On receiving the Security Council resolution, therefore, we sent a communication to the Secretary-General, in accordance with our earlier stand, informing him that we would be prepared to issue orders for a simple cease-fire effective from the appointed time and date, provided Pakistan agreed to do likewise. A copy of this communication is also placed on the Table of the House. Throughout yesterday, there was no further message from the Secretary-General, but in the early hours of this morning we received a message from him advising us to order a unilateral cease-fire in compliance with the relevant provisions of the Security Council resolution, with the proviso that our troops could fire back if they were attacked. This, of course, was entirely impossible. In a battle which is continuing, it is just not possible for one side to ask its soldiers to stop firing, leaving the other side free to continue its operations. Our representative at the United Nations was, therefore, instructed to inform the Secretary-General accordingly. A further report was received a short while ago that at the request of the Foreign Minister of Pakistan, an emergent meeting of the Security Council was convened, at which an announcement was made, on behalf of Pakistan that they also had agreed to issue orders for a cease-fire and cessation of hostilities. From our side, the requisite orders are now being issued to our field commanders to effect a complete cease-fire by 3-30 a.m. tomorrow morning. The Security Council Resolution refers to other matters which will require consideration subsequently. However, the policy of the Government of India in regard to matters which are of vital importance to us and which relate to the present conflict, has been stated by me on more than one occasion on the floor of this House and also in my recent communications to the Secretary-General. I do not propose to go into any further details at the present stage. Detailed discussions will have to take place and there would have to be a fuller study of the problems to which I have just referred. For this purpose, our representative at the United Nations will keep himself available to the Secretary-General. There will now be a cessation of hostilities. Peace is good. However, there is still a threat from the Foreign Minister of Pakistan, which he held out today, while speaking in the Security Council. We have, therefore, to be very watchful and vigilant. The nation has recently been going through its greatest trial. The times have been difficult but they have served a great purpose. The whole world knows now that the people of India-Hindus, Muslims, Sikhs, Christians, Parsees and others-constitute a united nation with a determined common will and purpose. On the battle front, the supreme sacrifice has been made by the members of all communities who have shown that they are Indians first and Indians last. To our armed forces, I would like to pay on behalf of this Parliament and the entire country, our warmest tributes. By their valour and heroism, they have given a new confidence to the people of India. Those who have lost their beloved on the battle front, have made a contribution to the preservation of our independence which will never be forgotten by a grateful nation. Their sorrow and their pride are shared by the whole country. Mr. Speaker, Sir, I would now seek your permission to express to all the members of this august House, to all the political parties in the country, to the leaders of public opinion, of labour organisations, of business and industry, and of many other voluntary associations, my feelings of the deepest gratitude. In the hour of trial each one of the 470 million people of this country stood up shoulder to shoulder to meet the challenge to our freedom. I should like to inform the House that on 18th September, 1965, I received a message from Mr. Kosygin, Chairman of the Council of Ministers. USSR, offering his good offices for bringing about improved relations between India and Pakistan. Mr. Kosygin is impelled by noble intentions. No one can ever contest the view that ultimately India and Pakistan will have to live together as peaceful neighbours. We cannot therefore say no to any efforts, which may help to bring about such a situation, made by those who are sincere and genuine in their feelings of goodwill and friendship. I have therefore, informed Mr. Kosygin today that we would welcome his efforts and good offices. I would also like to give the House some further details about the tragic incident in which the other day, we suffered a grievous loss. Investigations conducted on the spot show that the aircraft in which Shri Balvantray Mehta was travelling, was shot down by a Pakistani plane. The marks on the fuselage establish that gun fire had been used. Preliminary investigations by the Air Force authorities who also have visited the scene confirm that the aircraft was shot down at a low height. The ammunition recovered at the site of the crash also proves that the attacking aircraft was a Pakistani plane. That a non-combatant civilian aircraft should have been shot down in this manner is one of the most inhuman acts which we must all deplore and condemn. Shri Balvantrayji, his wife and the others who were travelling with him have laid down their lives at the altar of the freedom of the country. Their names will remain enshrined in our memory. We are still faced with the Chinese ultimatum. The House is aware that almost at the same time when the Chinese Government announced the extension of the time-limit of the ultimatum to India by 72 hours on September 19, their troops started provocative activities at several points of the border. On the Sikkim border, about which the Chinese have been making baseless and threatening allegations, the Chinese troops crossed the well-known and delimited boundary at Dongchui La and Nathu La on 20th and 21st of September respectively. They fired at our observation posts. They have tried also to intrude into our other territories. Our armed forces have clear instructions to repel the aggressor. Yesterday we sent a reply to the Chinese note of September 20 in which India was alleged to have intruded into Dum Chale and committed armed provocation. The Chinese charge was rejected as a fabrication and a cover-up for the intrusion and firing at Tsaskur to which I have referred a little while ago. The House is aware that on September 19, the Chinese Government sent us a note couched in unbecoming language, extending the period of the ultimatum, making demands for destruction of military structures etc. A copy of our reply has been placed on the table of the House together with copies of two other notes we sent yesterday. Regarding the so-called military structures we have already told the Chinese Government that if after joint inspection any structures are found on the Tibetan side of the border there can be no objection to their being demolished. I have been told that China has announced that some of these so-called structures have been destroyed by our troops while withdrawing. All this is a product of their imagination. I must tell the House that we view with grave concern the Chinese activities on the border and the armed intrusions into our territory. We have urged the Chinese Government in our note of September 21 replying to the Chinese note of September 19 to forsake the path of belligerence and intimidation and return to the path of peace and reason in its relations with India. I hope that even at this late hour China will respond to this call and prevent a major crisis. We do not know what the Chinese will do next. We have, however, to remain vigilant all along the frontier. There are times of the greatest trial for the nation, but the people all over the country are now in that mood which alone ensures the preservation of country's freedom. We may have to face many ups and downs, but I know the people have steeled themselves into a resolve to meet even this bigger challenge. On our Armed Forces, there may be a heavier responsibility. I have no doubt that they are in good spirits. We have no intention of underestimating the gravity of the situation. But we have resolved firmly to meet this challenge to our freedom. Year 1959 was a turning for Tibet, but also for the Sino-Indian relations. A turn for the worse for both, as in any case, the two are intimately linked. I have posted on my website, a large number of archival 'declassified' documents, often difficult to find, on the happenings during year 1959. It is called: “The 1959 Tibetan Uprising and its consequences”. If you find time, read some of these historical documents. There is no doubt that the events in Lhasa in March 1959, culminating by the uprising of the Tibetan ‘masses’ on March 10 and the subsequent flight to the Dalai Lama to India, triggered a chain of violent reactions from the part of the People’s Republic of China, which eventually ended in an open conflict in NEFA (today Arunachal Pradesh) and Ladakh in October 1962. The correspondence between Jawaharlal Nehru the Indian Prime Minister and Zhou Enlai shows the rapid deterioration of the India-China relations after the Dalai Lama was offered asylum in April 1959. Events in Ladakh with India realizing that China had built the Aksai Chin road across Indian territory, and in NEFA’s Subansiri Frontier Division (Longju) or Kameng Frontier Division (Khenzimani), are all collaterals of the Tibetans' arrival in India. A ‘SECRET IMMEDIATE’ telegram (No. 4484- Circular) sent by India’s Foreign Secretary Subimal Dutt to all the Indian Missions abroad in August clearly shows the linkage. We have transmitted to you by morse cast full text of the statement made by the Prime Minister in Parliament yesterday on the Chinese intrusion into our northern frontier in Ladakh and in the NEFA region. During recent weeks there has been mounting evidence of Chinese unfriendliness towards India. This has been causing concern to the Government and the people of India and there have been frequent questions in Parliament on the subject. There is also animated discussion in the press and despite our efforts at moderation Indian feelings are bound to be expressed in stronger language if the Chinese persist in their present course of action. 2. The Government of India attach importance to the maintenance of good relations and friendship with China and have always been anxious to do so. We can only attribute the present truculent mood of the Chinese authorities to their resentment at our having given asylum to the DALAI LAMA and the Tibetan refugees. Under international usage we could not refuse such asylum. There is not the slightest truth in the Chinese allegations that the recent disturbances in Tibet were directed from Kalimpong or that the Government or India are in some unexplained way responsible for these happenings. In fact we had nothing to do with the internal troubles in Tibet and were unaware of the Whereabouts of the DALAI LAMA until he had reached our border. As the Prime Minister made it clear in his statement before Parliament on April 27, India has no political interest in Tibet. We would naturally like to preserve our traditional cultural connections with Tibet and also to maintain, if possible, the age-old pilgrim traffic and trade with Tibet in the border areas. We have accepted Chinese suzerainty over Tibet and there is no question of our going back on it. At the same time the DALAI LAMA as the leader of a large section of Buddhists is held in respect by large masses of people in India and it is natural that the circumstances in which he had to seek shelter in India evoked the sympathies of large masses of people in India and several other countries in Asia. Under our Constitution Government cannot control discussions in the press or among the public on happenings, in other countries. Our Parliament is also sovereign within its sphere and questions in Parliament could not be suppressed by Government even if they wished to do so. We therefore consider it unreasonable on the part of the Chinese to expect us to suppress discussions on Tibet within the country or to regard such discussions as evidence of unfriendliness. We have already made it clear to the DALAI LAMA and the Tibetan refugees that we cannot recognize any Tibetan Government in India nor would we permit them to carry on hostile propaganda against any friendly country. At the same time it is not feasible under our constitutional procedures to gag the DALAI LAMA entirely. To suggest that the DALAI LAMA’S statements are being made with our previous knowledge or have our approval is entirely untrue. A year ago when the Chinese brought to our notice the alleged undesirable activities of some Tibetan refugees in our country, we took appropriate action and warned these people. In all our dealings with the DALAI LAMA and the Tibetan refugees we have been mindful of the need of avoiding needless irritation to the Chinese Government. 3. Unfortunately the Chinese have completely ignored our repeated reiteration of friendship for them. On the contrary they have adopted a policy of deliberate unfriendliness towards us. 4. Under the Sino-Indian Agreement of 1954 our Trade Agencies in Tibet are entitled to certain facilities. These have been denied by and large. Our Trade Agents are unable to secure suitable accommodation, the bag service between our Posts stands interrupted and they are being harassed in various small ways. A large number of persons of Indian origin have been resident in Lhasa for long years but have all the same maintained their separate group identity. Since before 1954 movement between India and Tibet was more or less tree and no documents of identity were required, these people had not taken up citizenship papers with them. They are now being prevented from contacting our Consulate and threatened with other unpleasant consequences. Similarly Indian traders in the border areas who were guaranteed certain facilities under the 1954 Agreement are finding it difficult to carry on their trade in view of many restrictions which have recently been imposed. 5. What is even more serious, the Chinese have launched on an active policy of violation of international frontier and intrusion into our territory. Large areas of Indian territory in the frontier region have been shown in the Chinese maps in the past as part of Chinese territory. We repeatedly drew the attention of the Chinese authorities to this incorrect representation of facts. Although Premier CHOU EN-LAI assured our Prime Minister in personal, discussions in 1956-57 that they would in practice respect the existing border even though they could not accept it as legally valid, the Chinese Premier seems to have gone back on this position in the correspondence which took place between December last year and February this year. In his letter of January 23, discussing the so-called McMahon Line in the north-east border, Premier CHOU EN-LAI referred to various complex factors and the need for surveys and consultations with the countries concerned etc. and left the matter rather vague. Our Prime Minister wrote a detailed letter to him on this subject in February this year. This letter still remains unanswered. We had however hoped that in the meantime the traditional border would be respected. This hope has not been fulfilled. On the contrary, a number of incidents have taken place last year and this year which have caused concern and resentment in India. At the end of July a strong Chinese detachment came into our territory in the Ladakh frontier and arrested a small Indian reconnaissance party within our area. Strong Chinese detachments also came into our territory at a number of places in the north-east frontier across the so-called, McMahon Line within the last few weeks. Only 4 days ago they fired on one of our frontier outposts and overran it and occupied a portion of our territory. We have still no information about our personnel who were manning that post. We have to resist such illegal intrusion into our territory and for any unfortunate consequences resulting from our defensive measures the responsibility must be that of the Chinese Government. 6. We deplore the present situation. It is to the interest of both China and India and world peace in general that India and China should remain firm friends. Unfortunately, although we have sent a large number of notes and representations to the Chinese Government, most of them remain unanswered. We can only attribute the present Chinese policy to serious misunderstanding of our intentions towards Tibet, but we hope other countries will not be misled by Chinese propaganda. We understand that Chinese have in fact started insidious propaganda against India among socialist and non-aligned countries. 7. We would like you to explain our policy and attitude to the Government to which you are accredited. In fact, the Chinese troops had deliberately crossed the pass and soon after they started claiming areas located a few kilometres, south of Shipki La as Chinese territories. 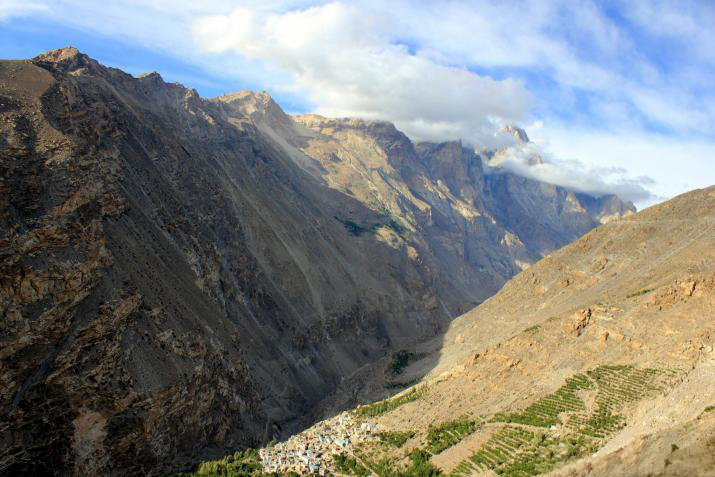 (1) Shipki La pass, (2) Mana pass, (3) Niti pass, (4) Kungri Bingri pass, (5) Darma pass, and (6) Lipu Lekh pass. The agreement also mentioned the Ladakh route: “the customary route leading to Tashigong along the valley of the Shangatsangpu (Indus) River may continue to be traversed in accordance with custom. 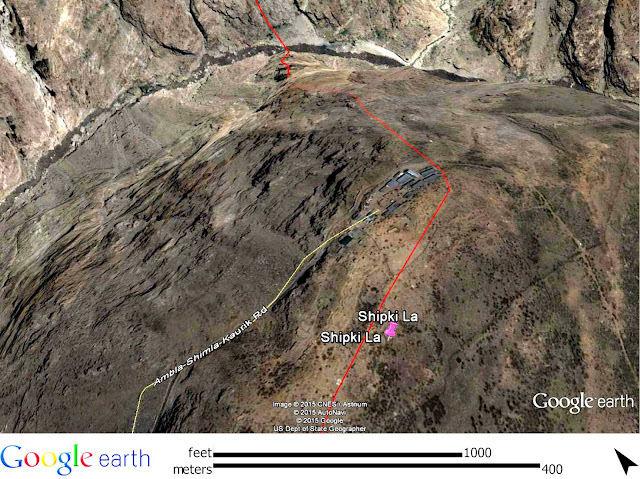 The intrusions meant that for China, passes such as Shipki La were not border passes, but located within China’s territory. Beijing’s interpretation of Article IV was: ‘the passes are only an indication of the route through which traders could enter India”. Let us continue with the story. Since the handing over of the last informal note to Charge d’ Affaires Fu Hao on the 8th September, the Government of India have received two reports of serious situations that recently developed between the Chinese and Indian border patrols in the region of Shipki La Pass on the Indo-Tibetan border. On 10th September, when a party of Indian border Police on its way to the Shipki La Pass sighted a party of Chinese military personnel on the Indian side of the frontier. The Chinese Party was commanded by a Captain and consisted of at least ten persons. The Indian Patrol signalled the Chinese Party to withdraw, but the latter did not do so. Thereupon, on the Indian Patrol trying to advance, the Chinese personnel threw stones at it and threatened to use their grenades. The Indian Patrol Commander pointed out that the border was in fact situated at the Shipki La Pass and suggested that the Chinese should accordingly withdraw. However, it does not appear that the Chinese troops withdrew, as the following morning (11th September) they were again soon on the ridge above the roadway on the Indian side of the Pass. The Position remained the same on the 12th September. The Chinese Government will no doubt agree that in throwing stones and threatening to use hand grenades, the Chinese patrol offered such provocation as could easily have resulted in serious and regrettable incidents. However, a development even more likely to cause an ugly situation was soon to follow. The Indian Government reminded the Chinese of the Panchsheel Agreement: “Shipki La is clearly the border and is acknowledged as such in the Sino-Indian Agreement of 29th April 1954, the Government of India consider any crossing of this border pass by armed personnel as aggression which they will resist." Nehru was in a dilemma: how to react? He wrote to the Foreign Secretary: "I agree with [your] suggestion …it would not be desirable for this question to be raised in the Lok Sabha at the present stage." Nehru decided to keep the matter secret but discretely mention it to the Chinese officials: "I think that if this question is raised in our Parliament at this stage, this might prove embarrassing from the point of view of the negotiations between Burma and China." The Indians MPs being unpredictable, they may raise a hue and cry, better to keep it secret and eventually ‘speak’ to Beijing. A meeting was however held on October 3, 1956 to consider how to handle the Chinese incursion. It was chaired T.N. Kaul, then Joint Secretary in the MEA. His colleagues Col. P.N. Luthra, Special Officer Frontier Areas and Dr. Gopalachari, the Deputy Director of the Historical Division were in attendance. So were H.C. Sarin, the Joint Secretary in the Ministry of Defence; he was accompanied by Maj Gen M.S. Wadalia, Chief of General Staff and Brig. K.H. Katoch, Director of Military Operations. The Home Ministry was represented by a Joint Secretary (N. Sahgal) and a Deputy Secretary (Rajkumar). The Chief Secretary to the Government of Himachal Pradesh and the Inspector General of Police had also come. The Prime Minister had directed that this was a serious matter and that it was not enough to lodge a protest with the Chinese. He had instructed that specific directions should be given to the Government of Himachal Pradesh to be passed on to the border checkposts and that these checkpost personnel should on no account withdraw from their present position. the building of certain aluminum huts, cave shelters and other allied matters were then discussed in detail. Since the Chinese troops had withdrawn it was not necessary at present to send our troops to this area, but a few Army Officers may be sent to make a reconnaissance right up to Shipki La and suggest ways and means of meeting a possible threat from Chinese troops next spring and draw up plans accordingly. A permanent police outpost should be established at Namgia with increased strength. Our personnel should be in physical possession of Shipki La pass before the 1st of April next and earlier, if possible. For this purpose, a permanent party, even though of a very small size, should be posted at the pass itself, or, if that is not possible, as close to the pass as possible. Construction of cave shelters and aluminium huts should be taken in hand immediately and these should be ready before March 1957. Constant patrolling from Namgia up to the pass should be done from now on as often as possible, weather permitting. The Himachal Pradesh representatives raised the question of increase in the strength of the border police and also the issue of rations to them. It was agreed. There is no question of sending any troops to the Shipki La now. In fact, even in the spring next year, I do not envisage the necessity of sending troops. The fate of Shipki La is not going to be decided by fighting or by a large show of force. Just compare with what happened in Burtse in Ladakh, where the Indian forces dismantle the Chinese structure and send them back on their side of the LAC and only then, discussed the issue during 2 flag-meetings (after the Chinese said that nothing had happened) and what happened in Shipkila in 1956. The moral of the story is that a 'show of force' always helps to prepare 'talks' with Chinese. It may be unfortunate, but it is a fact. The Indian Army (and their political bosses) seem to have understood the lesson during the past decades. Was General Zhang informed about Burtse? It is at least what Hong Lei, Ministry of Foreign Affairs’ spokesman affirmed in Beijing: "As far as I know, there is no such 'face-off' between China and India in the border area." And of course, he added, China is committed to maintaining peace and tranquility on the border area. Let us look at the facts from this side of the Line of Actual Control (LAC). As it happened before the visit of Premier Li Keqiang to India in April/May 2013 and also when President Xi Jinping arrived in Ahmedabad in September 2014, on September 11, the Chinese People’s Liberation Army (PLA) intruded on India’s territory. The next day, it was reported in the Indian press that a face-off had occurred in Burtse area, a few miles east of Daulat Beg Oldie (DBO), where the 2013 confrontation had occurred. The nationalist Chinese newspaper, The Global Times, quoting Jiang Jingkui, director of the Department of South Asian Languages at Peking University counterattacked: “this is not the first time that Indian media has reported 'confrontations' that do not exist in the Sino-Indian border area. These news are often untrue, negative, misleading and aimed at provoking public opinion, and are harmful to the relationship between China and India." Such media accusations are unreasonable, as Chinese troops have never intruded, he said. In other words, the PLA did not come, they not did see anything, they did not erect a tower. Conclusion: the Indian side must have been victim of a high-altitude mirage. Not only were the local Indian troops fooled by the visual phenomena (they quickly rushed reinforcements), but the Unmanned Aerial Vehicles (UAVs) and other Long-Range Reconnaissance and Observation System, mistakenly saw the PLA troops entering Indian territory near Burtse, erecting a tower and later massing troops. A more serious aspect has however not been mentioned in the Indian press. Just a day before the stand-off in Ladakh (which never was, according to the Chinese! ), a senior member of the Chinese Central Military Commission (CMC) visited the region. A coincidence, you may think? On September 9 and 10, a member of the all-powerful CMC visited Ngari Prefecture, which borders Ladakh, in Western Tibet. 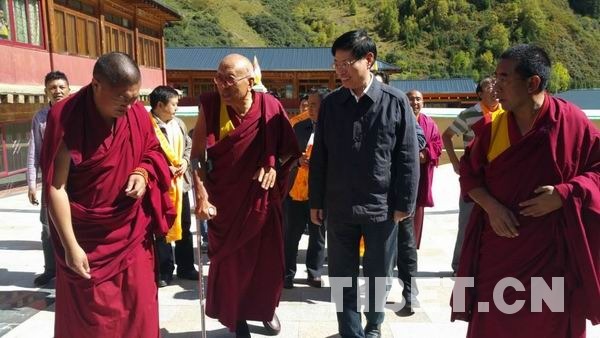 General Zhang Yang, Director of the PLA’s Political Department was in Tibet to ‘celebrate’ the 50th anniversary of the creation of the Tibetan Autonomous Region. At the end of the grandiose function held in Lhasa, the ‘Central’ delegation split into different groups. Yu Zhengsheng, chairman of the Chinese People's Political Consultative Conference (CPPCC) and member of the Standing Committee of the Politburo, who headed the delegation, went to Shigatse and visited the Tashilhunpo, seat of the Panchen Lamas. 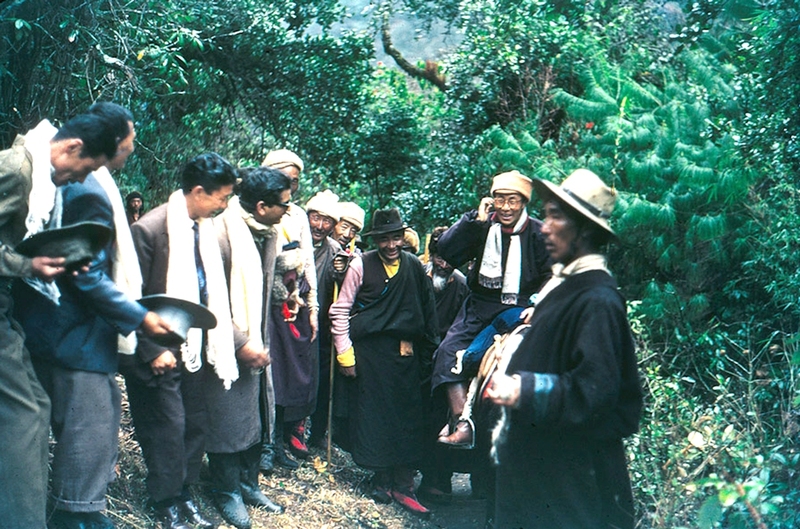 Vice-Premier Liu Yandong, also a member of the Politburo, headed towards Shannan (Lhoka) Prefecture, while Jampa Phuntsok, an old Tibet-hand ‘inspected’ Nagchu. Another ‘sub-delegation’ led by Du Qinglin, one of the CPPCC’s Vice-chairpersons went to Nyingchi, north of Arunachal Pradesh. The defence forces should uphold the correct ‘political direction’ and exert a larger role for safeguarding border stability and ethnic solidarity, he said. Does it help to ‘safeguard border stability’ by crossing over to the neighbour’s side? And this happened a day after General Zhang Yang spent 2 days in Ngari Prefecture. Officially, he came to convey the ‘loving care’ and the ‘deep feeling’ of the CPC Central Committee, the State Council, and the Military Commission to the ‘cadres and masses of all nationalities’, affirms the Chinese press. Like his colleagues in other parts of Tibet, General Zhang brought along a banner carrying President Xi’s words, ‘Strengthen National Unity and Construct a Beautiful Tibet’. Interestingly, though Ngari depends upon Xinjiang Military District (MD), Zhang was accompanied by Lt Gen Xu Yong, commander of the Tibet MD and not Lt Gen Peng Yong, the Commander of Xinjiang MD. What ‘bloody battles’ does General Xu refer to? Battles in Ladakh during the 1962 conflict with India? We will probably never know. Also in the delegation to Ngari, was Wang Yongjun of the Central Commission for Discipline Inspection (CCDI). A year ago, WantChinaTimes had reported that the CCDI’s boss, Wang Qishan had started ‘parachuting’ CCDI officials into key posts around China in order to strengthen the party's anti-graft campaign and bring new blood to certain regions. Wang’s presence may be an indication that heads could soon roll on this front too. Let us not forget that a ‘bloody’ battle against corruption, particularly in the PLA, is raging in the Middle Kingdom; more than 50 generals have already lost their jobs. Apart from the customary photo sessions with the ‘cadres and the masses’, (i.e. herders, farmers, toilers, etc. ), General Zhang Yang and his delegation “made a special trip to lay a wreath on the revolutionary martyrs’ cemetery,” said the Chinese press. Which martyrs? Of 1962 War again? 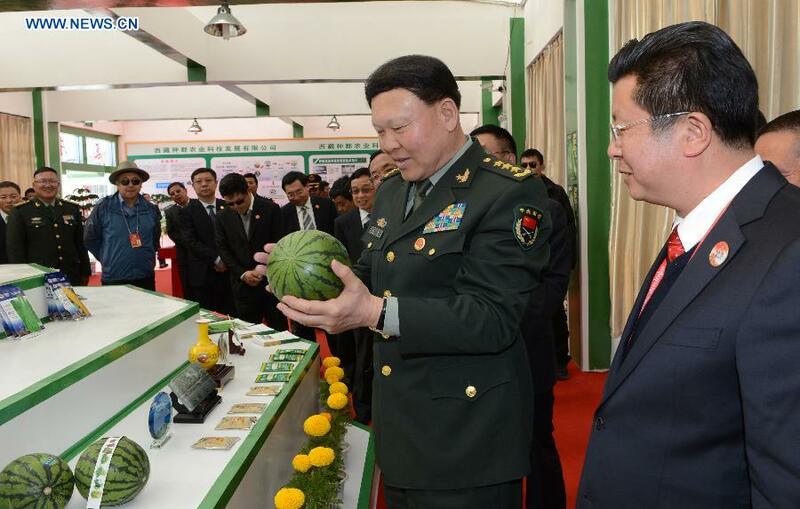 One line also mentions that Zhang 'visited the troops'. This raises an important question: was the CMC’s member informed that the PLA was planning to build a structure in an area considered by India to be within her territory? Let us presume that Zhang was not informed, it means that the PLA has a serious problem of command. A free for all in the PLA? If he was informed, it is a serious issue for India (despite Beijing’s denial). By the way, why did a Division Commander (Maj Gen Joshi) need to participate in a flag meeting if nothing had happened? Their ‘trial’ ride lasted 40 minutes. 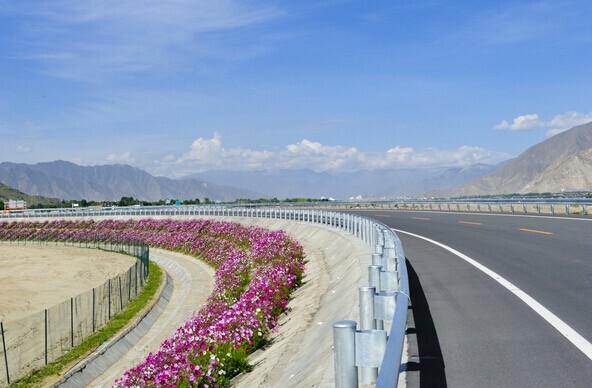 The Lhasa-Nyingchi high-grade highway is one of key projects of the Twelfth Five-Year Plan. It runs on a distance of 410 kilometers from the Tibetan capital to Nyingchi, located north of Arunachal Pradesh (i.e. the McMahon Line). 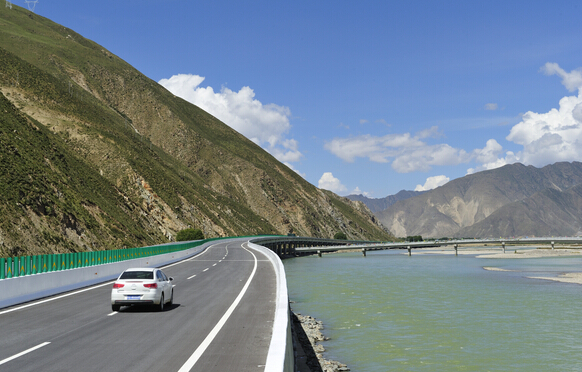 Once it opens to traffic, the journey from Lhasa to Nyingchi will be two hours shorter, compared to the present drive. 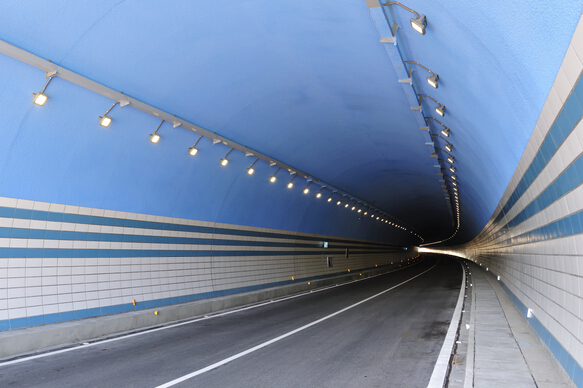 It is said that three rows of induction lamps will light up the tunnel, allowing drivers to have a good sight of road condition while inside the tunnel, says the China Tibet Online. The entire highway seems to be built for the sake of the Chinese tourists ...and the PLA (the main PLA's Headquarters in located in Bayi town, the terminus of the road). Soon after leaving Lhasa, the visitor can stop at a viewing point called Bagaxue Viewing Deck. With black-necked cranes crossing this wet land area in winter, passengers can see the birds ...if they are lucky. Then, 40 minutes away from Lhasa, in Meldro Gungkar, the visitor can take a bath in Dezhong Hot Spring. What is this monitoring equipment? Probably surveillance cameras to check the vehicular traffic! 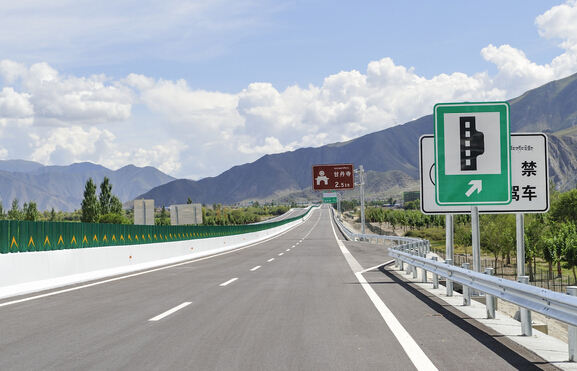 The Chinese website mentions that besides, monitoring equipment, all relays need to be fitted with solar panels and wind generators; further large LED screens will be installed to display information about the regions crossed and the traffic situation. Another piece of information on the fast-growing infrastructure development on the Tibetan plateau is given by Xinhua. 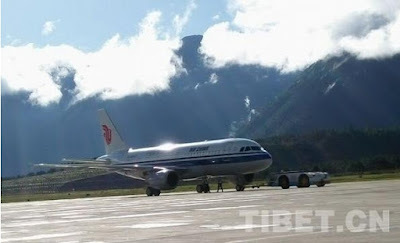 The Qinghai Airport Co. authorities announced that a new civil airport will open on the Tibetan Plateau by the end of this year. It is located in Golok Tibetan Autonomous Prefecture of Qinghai Province. The airport has been built at an altitude of 3,500 meters. It has a 3,800-meter-long runway and a 3,000-square-meter terminal. The construction is expected to be completed by the end of October. The announcement had to be made now, to coincide with the 50th anniversary of the Tibetan Autonomous Region (though Golok Tibetan Autonomous Prefecture is located in Qinghai). 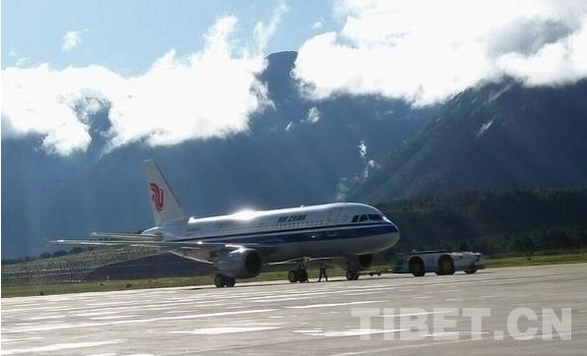 By the end of this year, flights from Golok to Xining, Lhasa, and Chengdu will be introduced. It will be the sixth civilian airport in Qinghai province and the first in Golok. The Golok tribes have for century been the most unruly Tibetans. Beijing probably expects the airport and the hordes of tourists to transform the Goloks into docile tour guides. But Beijing has decided to develop the infrastructure instead and bring more millions of Chinese tourists. This will not help removing Tibetan resentment. Despite the cancellation (or postponement) of the French Defence Minister, Jean-Yves Le Drian's visit to India, the 'Deal' for 36 Rafale fighter planes, should soon be signed. It is at least what the Indian Air Force hopes. Narendra Modi's decision to purchase the planes 'off-the-shelf', during his April visit to Paris, was a quick, pragmatic, and smart move. He brought the IAF's 'critical operational necessity' on the negotiating table, while dropping the Medium Multi-Role Combat Aircraft framework. Waiting for the final deal to be signed, it is interesting to read a letter sent by H.S. Malik, India's Ambassador to France to the Prime Minister Jawaharlal Nehru in October 1953. 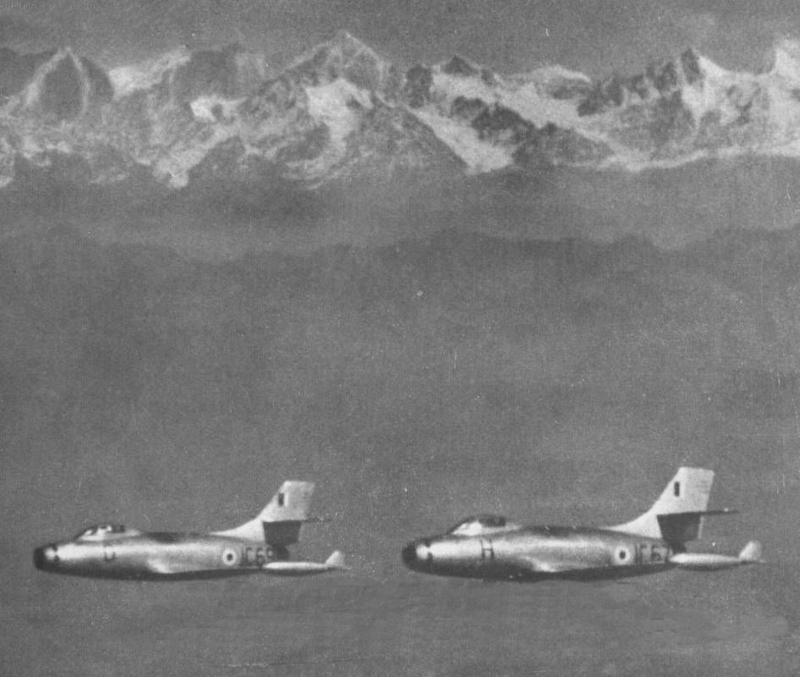 At that time, India had just purchased 71 Ouragans (known in India as Toofanis) from the same Dassault. Incidentally, the new avatar of Dixmude (the third one), has recently made the news. It is a helicopter carrier of the French Navy and an amphibious assault ship of the Mistral-class. France was to deliver 2 Mistrals to Russia, but decided at the last minute to put off the deal and refund Moscow, in protest against the Russian intervention in Ukraine/Crimea. A ship, with the same name Dixmude, brought the Ouragans to India in 1954. Here is Malik's letter to Nehru. Let us remember that the question of the French settlements in India was not solved at that time. The de facto transfer of Pondicherry and the 3 other settlements (Yanon, Mahe and Karikal) will only take place a year later (November 1, 1954). All of us in the Embassy who have been working on the implantation of the contract with the Defence Ministry here for the supply of Ouragan aircraft were greatly relieved and delighted when we got the news that our four pilots with the four Ouragans had reached Palam safely. This flight from France to India has involved a great deal of organizational work for which much credit is due to the team of the Indian Air Force Officers working here under Wing Commander Akut. In this connection, I venture to being to your notice the wonderful cooperation that we have received both from the French officers of the Ministry of Defence, from the Cabinet Minister downwards, and from the French industry. We signed the contract only last June. Already four planes have reached India; another 35 are being sent on October the 30th on the aircraft carrier DIXMUDE, and the remainder, 32 aircraft, will be dispatched in January 1954. I think you will agree that this is indeed prompt execution of the agreement as embodied in the contract between us and the French. This agreement is being carried out both in the spirit and in the letter and there has been no instance of any attempt to delay or obstruct. Our pilots who came here to learn to fly this type of aircraft, which was new to them, won the admiration and respect of the French Air Force and, generally speaking, the other members of the Indian Air Force who have come to France for the requisite training to enable them to carry out the servicing of this aircraft in India have, in spite of the language handicap, applied themselves with energy and devotion to their task and have made friends and won the respect of the people among whom they have lived. I am personally very proud and full of admiration for the way in which Wing Commander Akut and his team of technical officers have done their job here and of the way in which our pilots and the other Indian Air Force personnel have done their job in France. I have been thinking for some time whether it would not be possible to use the opportunity provided us by this cooperation and collaboration by the French to relive somewhat the existing unfortunate state of relations between India and France on account of the position which we naturally have had to take up vis-à-vis the stupidity and lack of imagination of the French over the question of the French Settlements in India as also over the question of the French North African Possessions. Yesterday, when I was lunching with the President at Rambouillet, an idea came to me after my conversation with Mme Paul Auriol, daughter-in-law of the President, who as you probably know is a most distinguished and famous Aviatrix, being one of the two women who have crossed the sound-barrier. Mme Paul was present at the luncheon and during our conversation which was over the subject of the supply by France, of the Ouragan aircraft to India, she said laughingly: “Wouldn’t be nice if we could all be at Bombay to be present on the arrival of the DIXMUDE with the 35 French Aircraft purchased by India, on board?” Incidentally, the President was most friendly at luncheon and, among other things, drank a toast to India coupling your name with it, and hoping that France and India would go ahead working together in the cause of peace. Mme Paul Auriol’s remark revived in my mind what had already been simmering there on the subject of some gesture by us to show the French how much we appreciate their cooperation in this matter. I feel that it would be a nice gesture on our part if we could fly out by Air India and back, the French Air Minister and his wife, the principal officer of the Air Ministry with whom we have been dealing (Commdt. Serralta), the Head of OFFEMA who have been the intermediaries between us and the Defence Ministry, and the Head of the firm Marcel Dassault who assemble the aircraft. I would also include in the party, Mme Paul Auriol because of her extremely distinguished flying record which is the pride of France. Her inclusion would have a very good effect on French public opinion. From our side, there would be myself and my wife (since the Air Minister's wife would be going, I think it would be proper if my wife also was in the party), our Military Attache Brig. Chopra who has been in general charge of the execution of the contract, and Wing Commander Akut who has been personally responsible for most of the work,. My idea would be that the entire party should reach Bombay in time to be present when the DIXMUDE reaches Bombay (say, about the 20th November). They could then participate in any official ceremony that might be arranged for this occasion. They would then be flown to Delhi where the French members of the party would be the guests of the Government of India for 4 or 5 days during the course of which some sight-seeing and some social functions might be arranged for them. I believe that a gesture of this kind would help a lot in taking away some of the bitter taste that is at present attached to French Indian relations. I realise that this proposal involves a good deal of expenditure on our part, but I believe it would be money well spent. In this connection it would perhaps be pertinent for me to tell you of an incident in connection with this contract which I believe is significant and representative of the spirit in which the French are implementing the contract. Although the contract did not provide for it, in the informal talks the subordinate French representatives had told our people that they would provide an aircraft carrier for the transport of these planes to India. Subsequently, it transpired that this particular aircraft carrier was not available as it had gone to sea for certain manoeuvres. The French then told our people that the aircraft would have to be shipped to India by ordinary merchant ships. Since under the contract we have to bear the expenses on the transport of the planes to India, this would have involved not only considerable delay but very heavy Charges both on account of freight and on account of dismantling, packing etc., of the aircraft before shipment. When I heard all this, I immediately got into touch with M. Pleven, the Defence Minister, and told him of this development and asked for his intercession. He assured me straightaway that he would look into the matter personally and see to it that we got satisfaction. Thereafter, another aircraft carrier was placed at our disposal as a result of the personal intercession of the Defence Minister himself. This has saved us not only great inconvenience and delay but something like Rs 5,50,000/-. The point is of course that the French were not bound to do this under the terms of the contract and did it as a gesture of goodwill towards us. I feel strongly that it would be well worthwhile to reciprocate this goodwill by the plan that I have ventured to put forward to you in this letter. I have of course not mentioned this idea to any of the French officials, and will do so only if you approve. I have no doubt that a visit to India by the above party as the guests of the Government of India would be greatly welcomed by the French. Where were the Panchen Lamas? Has China decided the Future of Tibet?